Textkernel can directly match a profile (from your resume database, job board or social media) to both your own jobs and all online jobs in the Netherlands, Germany and France with our product Jobfeed. 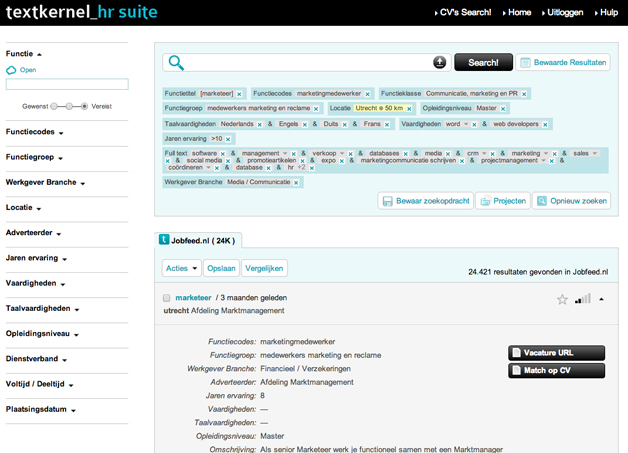 Textkernel uses the text of the CV (resume) of profile of the candidate and automatically creates a search. The search can be performed on your jobs and with on all online jobs found by Jobfeed, Textkernel’s Big Data tool for jobs. Jobfeed collects and structures all online jobs and makes them searchable. With the addition of Jobfeed to Match!, you can match a profile to all online jobs in the market, allowing you to quickly find that relevant job for our candidate, client or employee. With Textkernel’s technology you can easily offer job seekers and applicants an overview of your jobs that match his or her resume. When you integrate the semantic search technology into your job board, career site or website, you can offer job seekers the option to easily search your jobs with the user-friendly interface of Textkernel. When an employee becomes redundant or you get a new client for mobility, reintegration or outplacement, you can use their profile to find them a new job with Match!. With the addition of Jobfeed you get access to all online jobs in the Netherlands, Germany and France that you can easily and accurately search.